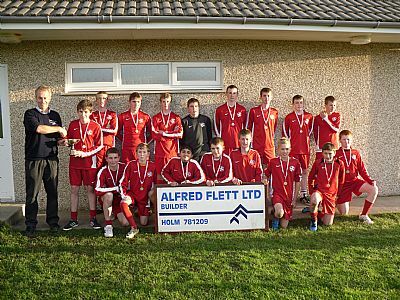 There is a new name on the Maurice Walls Cup after East United narrowly edged out Dounby by a single goal in a highly competitive and closely fought final at Picky in the final competition of the Under 15 season. There was not much to choose between the sides in the first half with a number of attempts on goal by both sides but these were mainly from distance and did not trouble either goalkeeper. Whilst Dounby started the brighter with a Mark Sinclair shot going narrowly wide in the first minute it was East United who had the most clear cut chances of the first half. Firstly after 25 minutes Dounby keeper Scott Smith did well to tip a long shot from Joe Wilson onto the bar, and then 5 minutes before half time Liam Delday ran through and rounded the keeper and just as he was on the verge of shooting the ball into the empty net, an excellent last ditch tackle by a Dounby defender prevented a certain goal. Overall however both defences played very well and the game remained goalless at half-time. It was Dounby who started the livelier of the teams in the second half with Andrew Harrold firing over the bar, but again it was East who came closest to scoring when Logan Peace rattled the post with a fine long drive 10 minutes into the half. There followed a couple of half chances for Dounby with both Harrold and Taylor Pilkington Tait firing straight at the East keeper. It was looking increasingly likely that the first goal would be decisive and the breakthrough came after 20 minutes for United. The ball broke to Joe Wilson just outside the box and he controlled the ball before firing a fine long shot low into the net with the aid of a slight deflection. Wilson had the ball in the Dounby net 5 minutes later but the goal was rightly disallowed for being offside. Dounby pushed forward in search of an equaliser as the game neared its end, but they had to be wary of East United counter attacks. The game ended with neither team able to add to the scoring and United players and spectators celebrated the narrowest of victories. An enjoyable and hard fought match played in a sporting manner, which kept both sets of fans on edge until the final whistle. Overall United just deserved their victory having carved out the better chances but tough luck on Dounby who were looking for their first victory in this cup since 2000. The presentation ceremony at the end of the match was covered by former OYDG Chairman Jim Cormack who congratulated both teams on putting on such a competitive match and introduced sponsor Marty Flett who presented the Cup and winners medals to East United. OYDG would like to thank Marty for his continued sponsorship of the competition and Gavin Leask for refereeing the match. 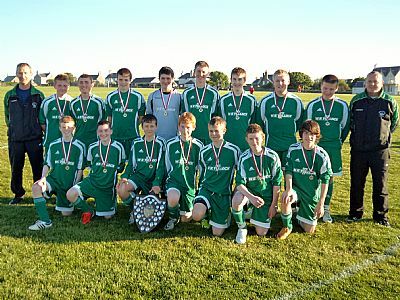 The destination of the Merriman Shield Under 15’s league was decided in an exciting final match played at the Bignold on Monday night (25th June). Thorfinn needed a victory whilst a draw would have been sufficient to secure East Utd their first league triumph. For the first 10 minutes the game was pretty event until Thorfinn stunned East with two goals in as many minutes Both goals were scored by Jack Paterson, the first a tap in after a Ben Stout drive came back off the post and the second a lob over the keeper after being played through. After the initial shock of losing the opening goals it was East who took the initiative for the remainder of the half with Connon Rendall, Ciaran Drever, and Joe Wilson all going close to pulling a goal back for United, before Logan Peace eventually scored the goal that United’s pressure deserved. Thorfinn would have been pleased with their half time lead of 2-1 given the number of chances created by East. The second half started as the first half finished with East United creating more chances with Joe Wilson shooting over and Liam Delday going close with a header. Sam Kennedy in the Thorfinn goal was also in outstanding form pulling off a number of excellent saves to deny the East forwards. Thorfinn were being penned back in their own half but were defending well and relying on quick counter attacks and from two of these breakaways Ben Stout had a shot well saved by the East goalie and Jason Scott shot over from long range. East’s final chance to equalise came minutes from the end of the match but once again Sam Kennedy pulled off an excellent save from a Ciaran Drever shot. With a bit more composure in front of goals East would have no doubt got the second goal that their play deserved but Thorfinn’s resolute defending saw them hang on for the narrowest of victories. At the end of the match OYDG Chairman Stephen Crawford praised both teams commenting on how good it was to see the league going to such an exciting final match. He thanked Merrimans for their continued sponsorship of the competition, the clubs, supporters and referees who have supported this year’s league competition, before inviting Thorfinn captain Seumas Mackay to step forward to receive the Merriman Shield. Thorfinn’s victory is their third in a row in this competition. 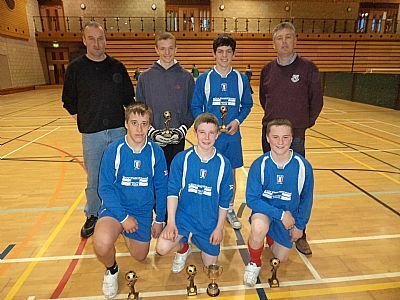 An epic West Mainland final in the S4 & Under Hourston’s Indoor 4’s in Picky on Friday evening (27th April) saw Dounby B emerge victorious after a marathon sudden death penalty kick shoot out with neighbours Stromness A. It was Dounby who opened the scoring in the final with a sharp shot from Ewan Brown, but shortly afterward Ross Slater slammed a powerful drive in off the post to give Stromness the equaliser. Both teams had chances to win the match in normal time with Stromness hitting the post and both keepers pulling off fine save to keep the teams level. Neither team could produce a winner in extra time with Dounby coming closest hitting the post. There then followed what was possibly the longest penalty shoot out in the history of Orkney youth football with Dounby eventually emerging victorious 15-14. 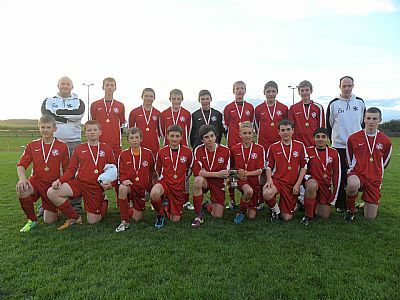 This was a tough way to lose the match for Stromness, but for a delighted Dounby it represented their first victory in a youth football competition for a number of years. Following the final match OYDG Vice Chairman Euain Penny congratulated both teams on their performances describing them as the stand out teams in what had been a first class competition. He thanked Tom and Alison MacPhail for their continued long standing sponsorship of the Indoor 4’s competitions, and handed over to Tom who presented the trophy and winners and runner’s up medals to the two teams. Finally OYDG would like to thank the two referees for the evening Jimmy Leask and Lennie Merriman who helped the competition run so smoothly. 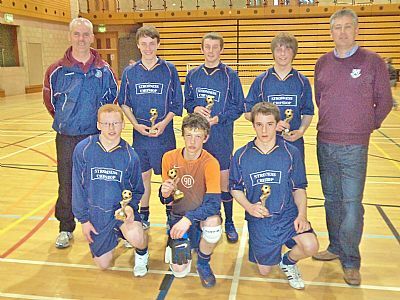 Thorfinn A 1 Dounby B 2; East Utd B 1 Stromness A 1; Rovers B 0 Thorfinn A 0; Dounby B 1 East Utd B 1; Rovers B 1 Stromness A 2; East Utd B 0 Thorfinn A 2; Dounby B 1 Stromness A 1; Rovers B 0 East Utd B 2; Stromness A 1 Thorfinn A 0; Dounby B 4 Rovers B 1. Thorfinn C 1 Dounby A 1; East Utd A 0 Thorfinn B 1; Rovers A 1 Thorfinn C 0; Dounby A 0 East Utd A 1; Rovers A 0 Thorfinn B 1; East Utd A 2 Thorfinn C 0; Dounby A 3 Thorfinn B 0; Rovers A 1 East Utd A 1; Thorfinn B 2 Thorfinn C 0; Dounby A 2 Rovers A 3.